The set up is great, organisation incredible and Graeme and Neil are welcoming and approachable! Already looking to plan my next holiday with them! Couldnt recommend more highly! The sessions are well designed and by the end of the week you can see a massive improvement! There was a variety of different running and cycling sessions that tested many attributes. Embrace were superb at looking after us and cook up a storm every single night whilst ensuring a social and super friendly atmosphere! I would highly recommend and wouldn’t hesitate to booking it again! 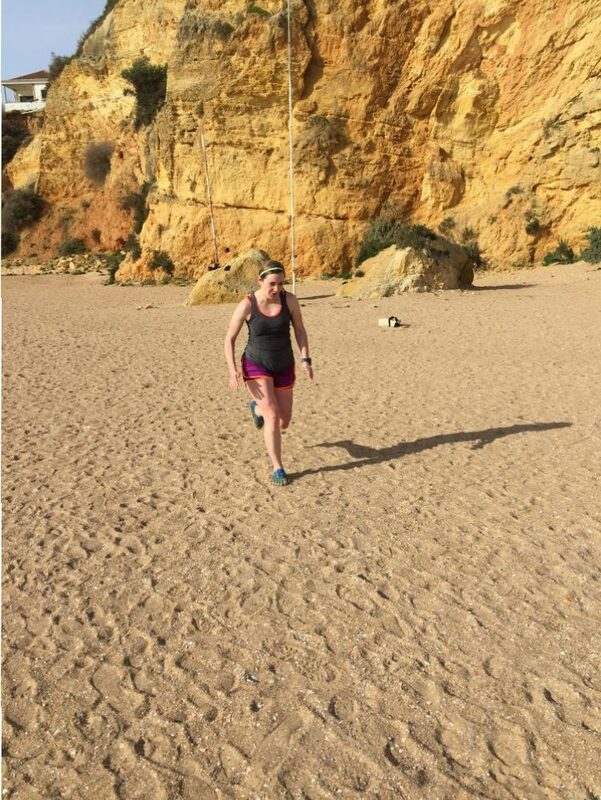 I attended the Duathlon holiday in the Algarve in Feb 2018. Neil, Graham and Kat were perfect hosts and coaches, providing race tips, coaching sessions and keeping us well fed on homecooked food. The local area is ideal for training; quiet with a variety of terrains (trail running, flat roads, hills, mountains) within easy reach. All sessions catered well for individual goals without overloading for the week, with plenty of downtime to chill out in between! Lagos itself has a couple of decent local restaurants and bars for any nights off. Fabulous trip. An early Camp in Feb has set me up to help me complete my goals for 2018. Great location, great weather, great terrain for cycling and running. This was my 9th Trip with Embrace and it was as good as all the others. Looking forward to the Alps trip in June already. This was my 3rd Embrace camp after having previously been to the Alps and the Pyrenees, and it undoubtedly lived up to the high standards set by the other camps. The coaches are fantastic and are focussed on making sure that everyone’s individual needs are met – from training, nutrition and recovery, they ensure that everything is catered for, enabling the participants to get the most out of the week. Would recommend to runners/cyclists/triathletes of all backgrounds or abilities. Particular shout out for the incredible meals that the guys cook up every evening, they are always a real highlight of the week! We had such a good time at the Running week they let stay for the Duathlon week- equally as god. They did a wonderful job again dealing with all abilities and ages from early 20’s to those of us nearer 70. This was my first embrace holiday and it was an amazing experience. From the excellent organisation to amazing training sessions with great variety and coaching to the lovely villa and brilliant dinners!! For the price you pay this holiday delivers everything and more!! 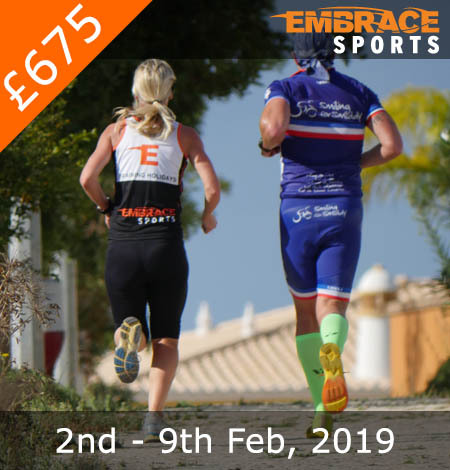 For anyone who wants to get away and complete some good duathlon training in a fantastic setting with a great bunch of people you should book now!!! What a great way to spend a week! Neill, Graeme and Kat ran a masterclass in handling a mixed ability group ensuring we all got what we wanted out of our time with them. It surprised me greatly what I achieved by the end of the week. Location and food were excellent and the training well balanced. The whole set up is a lot like Eric Clapton plays guitar – easy going, laid back, seemingly effortless ( it isnt!) style but technically spot on whatever the discipline. If you want to train well, eat well and achieve lots then an Embrace week is what you need. Cant recommend them highly enough, whatever your age or ability. Fabulous week with the Embrace Team in Portugal. This was my third time on an Embrace camp, but first venturing into duathlon. Thoroughly enjoyed every aspect of the week. The week was a fabulous balance of intensity and variation. You have the opportunity to make the week as hard or relaxing as you choose, and regardless of your preference the skilled coaches will productive, but most importantly, really enjoyable. I very happily recommend this as a terrific week, whether to get fitter, sharpen up for a race, learn from experienced coaches, see some beautiful scenery…. or just not have to cook your dinner for a week! 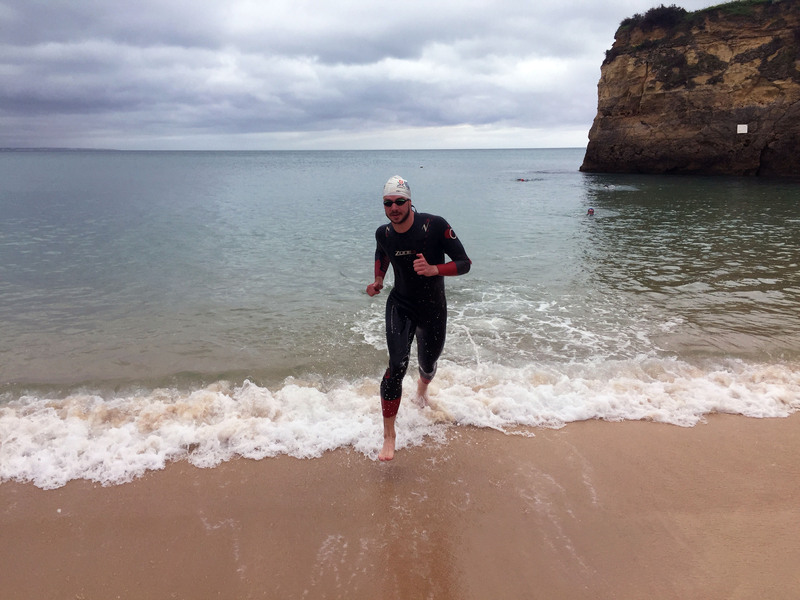 Another terrific triathlon holiday in the Algarve, learning new ways to improve performance, spending time in the ocean, running and cycling up formidable hills and through gorgeous scenery. Excellent bunch of people from an amazing variety of backgrounds, all connected by a love of sport and hugely supportive of one another. Would certainly recommend to triathletes of all standards. I booked this trip as I thought I might give triathlon a go, I’ve lacked direction in my training for a few years now and wanted a new challenge. I had never done any open water swimming and only ever cycled as a commuter through London traffic. The coaches are so passionate about their sport I have well and truly got the bug, this holiday has given me a renewed passion for training and some real focus. The first day in the water I saw shark fin rock and thought ‘that looks miles away’ at the end of the week we did a session and I swum round it…twice in one set! The food was awesome and the relaxed attitude from all the staff made for an excellent training holiday, I’ll definitely be back! I’m not a youngster and was quite worried about joining others on this type of holiday, but I needn’t have worried. I’ve been through quite a traumatic year and needed to restart my training and this week certainly did that. It was hard, it was fun, it was really informative both from the coaches and other athletes. I really ‘enjoyed’ myself, I was pushed to the extreme and it’s amazing what you can do when you are pushed, but it was great, and I can certainly see myself booking into another week again. This was my 3rd trip with Embrace and didn’t fail to live up to expectations. As more of a cyclist than anything else, my previous trips were in the French Pyrenees and this was my first trip Lagos. With less of a cycling focus, I was forced out of my comfort zone and to literally dive in at the deep end. Organisation was slick and forced me to work on my weaknesses. The formula is simple; work hard but enjoy yourself and it definitely works for me. Behind it all are great coaches who clearly enjoy what they do and that’s the real difference. This was my third outing with the Embrace crew and yet again left me absolutely in awe. The coaches (Graeme, Neil, Lucy and Eric) are top class, their encouragement, support and cooking is second to none. We were all very inexperienced on the week, and they catered for every single persons abilities- from those who couldn’t put their heads under in the sea, to those who needed to improve their stroke to those who needed some healthy competition. Again the food was incredible, the company was excellent and the whole trip was exceptional! After being recommended by a friend I decided to book my first Embrace sports running holiday and it didn’t disappointed 1 bit. The apartments were exceptional the food cooked by the guys wasn’t only healthy but super tasty. The running side was for all abilities and produced some stunning views. I enjoyed so much that I actually booked my next trip whilst still in Portugal. Would highly recommend this trip to anyone considering this trip. The photo is of my husband & I relaxing on the beach after the duathlon challenge known as “hell on the hills”! It era amazing – great fun and challanging. The triathlon training week was well organised and thoroughly enjoyable. 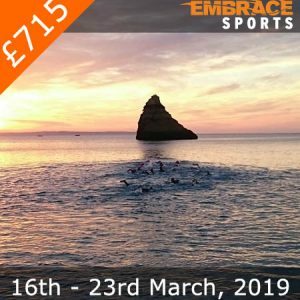 A friend of mine recommended Embrace last year and after completing my first sprint triathlon I decided to sign up. 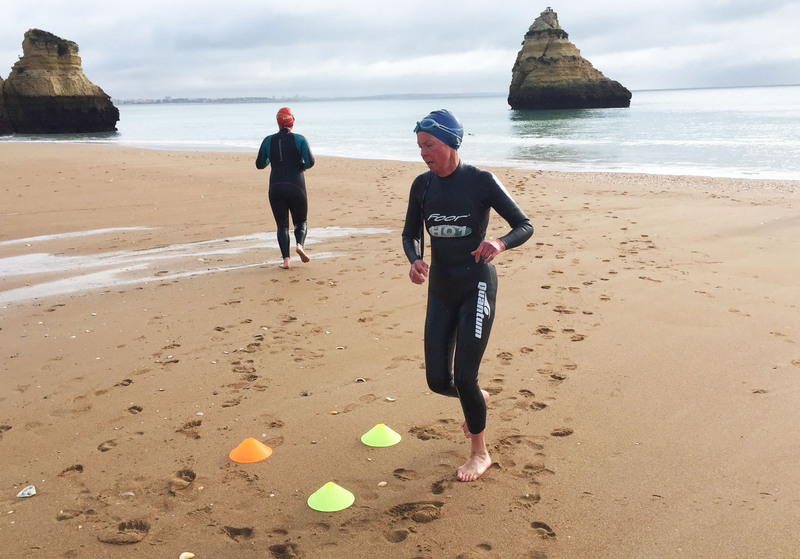 What a great way to start 2017 – a week of triathlon coaching in sunny Portugal! It was a fantastic week, being so new to the sport it was brilliant to learn so much from the coaches and pick up lots of tips and tricks to take me into my first triathlon race season. It was great being surrounded by so many like minded individuals and really seeing what we could achieve. I loved being out of my comfort zone and seeing how my body coped with the volume of training. This week really made me see just how much we are truly capable of which as it turns out – is far greater than I expected. I will definitely be booking my next Triathlon camp again! 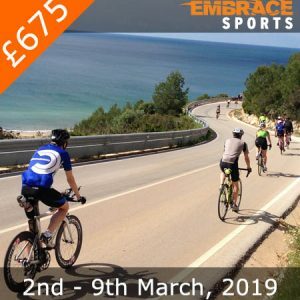 I first joined Embrace for the February Triathlon Holiday in 2016, and after a fantastic week, I was completely sure I would come back. And back I came, one year later. It was fun to do some of the same sessions as we did a year earlier, and see how my fitness had improved. The coaches were great, and as always they did a great job giving us sessions that worked for a lot of different levels of fitness and experience. Lagos really is a perfect location for triathlon training; there are so many beautiful places to swim/bike/run, and it feels great to train outdoors while winter is in full swing back home. The food was maybe even better than the previous year, and the mixed group of runners and triathletes was fun to hang out with. 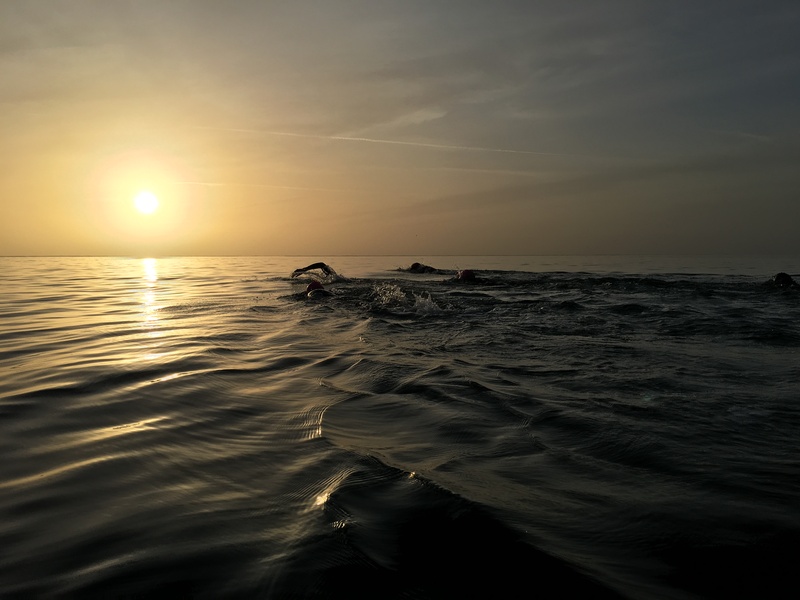 I booked this holiday because I had signed up for a couple of sprint triathlons, and I wanted to learn about the sport and see if it really was something I liked. And of course I wanted to have a week of good training. I enjoyed almost every minute of the holiday. I put my body through a lot more then I ever have before in such a short period of time, and it was great to experience that I actually could do that. The coaches were very attentive, and somehow managed to give me individual tips and feedback whenever I needed it, even when the whole group trained together. The food was fantastic, and it really is true that they cater to all dietary requirements, however difficult they may be.